We’re extremely excited to announce that we’re committing several acres of our upper pasture to coffee farming. The coffee farming area will be incorporated into our Environmental Learning Center at the southern most part of the property. The remainder of the upper pasture will continue to be used for our horsemanship programs, and uses as related to Sunset Stables. 2. Red Catuai. The Red “Cat” is a hybrid of Mundo Novo and Caturra and originated in Brazil in the late 1940’s. This variety is common in Hawaii and provides an extremely high yield. These trees do not grow as tall, but can be much fuller than other varieties. The Red Cats are also known for the richness in flavor. 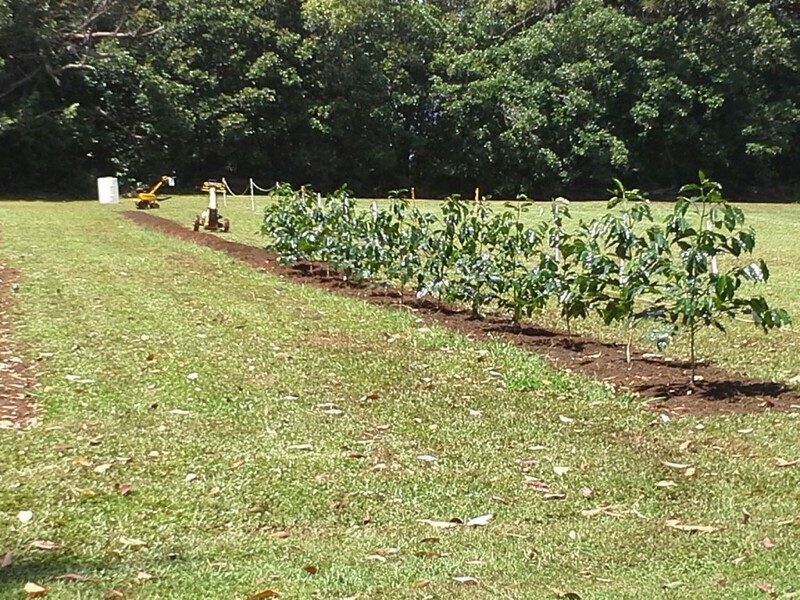 Here is a picture of some year old coffee trees at Sunset Ranch! While one could argue that the rainfall is sufficient to manage our small coffee farm; we have decided to install a drip line system throughout this dedicated area in order to best manage the dry summer months. The water system will be completed, and all remaining trees will planted, this summer. We’ll keep you posted on their growth! We can’t wait for our first harvest!